This hedgehog was spotted wandering around in broad daylight whilst young members of the Ackworth School Natural Hisory Society were heading out to do some sweep-netting for invertebrates. It’s never a good sign when a hegehog is seen during daylight hours and I expect that this one was in some sort of difficulty, forcing it to search for food when it should be in hiding. Hedgehogs are in decline as life is being made increasingly difficult for them by things such as fences with concrete panels at the base. These severely limit the hedgehogs’ ability to roam from garden to garden as they feed. Excessive tidiness and the increase in the area of gardens being paved over have also reduced the area of suitable habitat. If you want to help hedgehogs, you should try to leave some untidy or densely planted areas for them. I have recently made a hedgehog house in a corner of the garden using a large inverted plastic planter. This has had an entrance hole cut in the side and it has been covered with leaves and twigs. A similar home that I made a few years ago was used by hedgehogs. 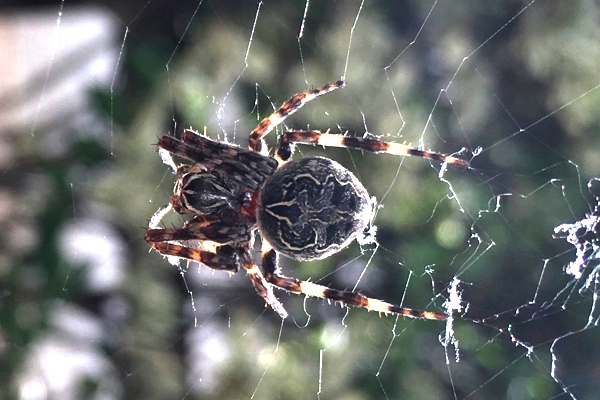 I found and photographed this bridge orbweaver spider this week. The species is often found near water but it also occurs in other habitats. It is said to have a fondness for man-made structures, in preference to vegetation. It is often found on steel structures.